4 Corner IT’s network support is part of a unique selection of IT management services including network security, data management, cloud solutions, project deployment, and disaster recovery. Each business network in Miami is different and requires a personalized approach. 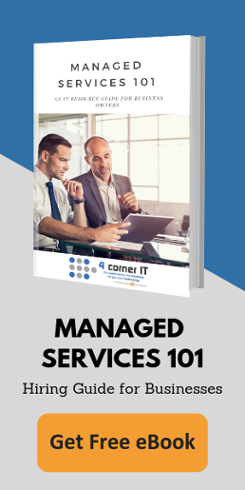 Because of this, there are many factors you should take into account when choosing a managed services provider. 4 Corner IT, founded in 2000, provides top quality network support to the South Florida area including Miami, Fort Lauderdale and West Palm Beach. Our growth and success is based on our ability to understand our client’s network and their business needs, and supporting both using only the best technologies. Our services can be packaged into a monthly support agreement or individually. You may only want network support to cover daily operations or you can choose to take advantage of our cloud services and disaster recovery solutions. Alternatively you can choose not to utilize our desktop support plans but simply cover your server hardware only. Fine tune our available “managed services” to fit your budget and needs. Our advisers are both informative and friendly. They will survey your network and discuss with you the available options. When it comes to choosing the right network services and solutions provider there is only one, 4 Corner IT. Live Chat – Click the blue button at the bottom of the page. Send an Email – By using the Contact Form on this page or on our Contact page. Call us at (954) 474-2204.